To follow on from our recent tour of the Via Appia Antica, we’ll move into the centre of Rome to visit some of the most important locations of this ancient city. 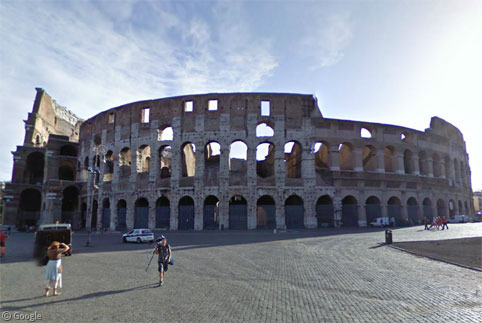 Google’s imagery has improved considerably since we visited the Circus Maximus and the Colosseum back in the early days of this site. 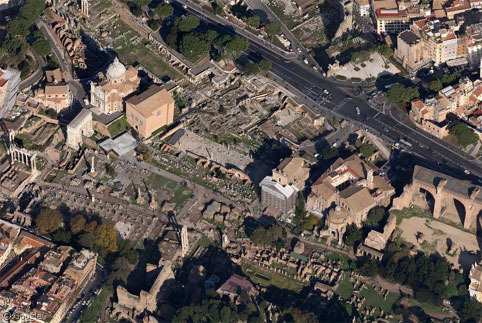 We now have 45° aerial photos and Street View imagery from cars and trikes which allow us to see in great detail the timeworn structures which are just part of a larger World Heritage Site called The Historic Centre of Rome. 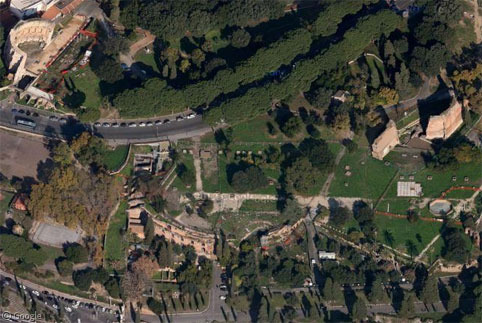 Palatine Hill (one of Rome’s seven hills) is the oldest part of the city, with traces of civilization dating back to 1000BCE. Roman mythology tells us that the hill also housed the cave where Romulus and Remus were found by a she-wolf; with Romulus later going on to found the city. Recent archeological excavations have revealed what is believed to be the legendary cave, as well as a house where Augustus – Rome’s first emperor – was born. 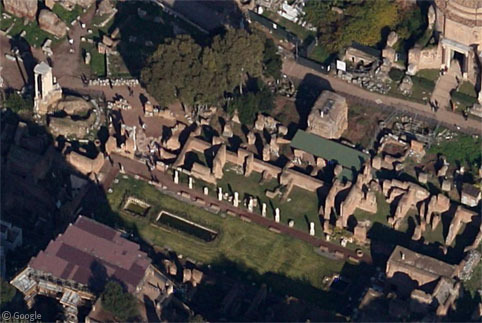 Hadrian apparently didn’t like the location so had a large villa built near Tivoli, which we’ll visit in a future post. 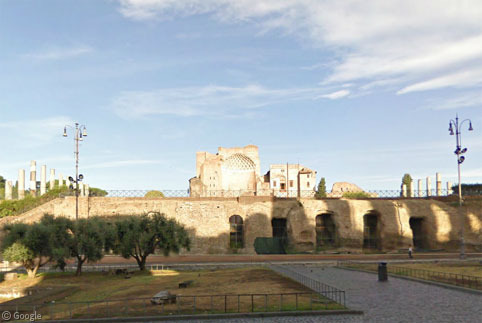 A number of Roman emperors built palaces on Palatine, including Augustus, Tiberius and Domitian, who – in the 1st Century – built most of the structures which are still visible on the site, including the Flavian Palace, which was generally used for state business. …which included an octagonal fountain. 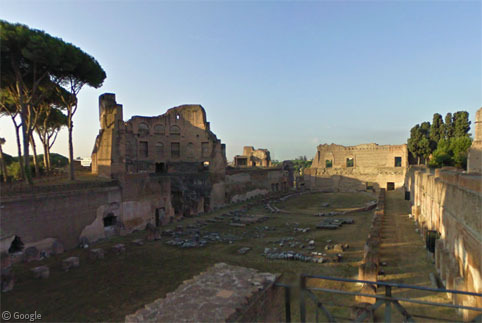 Domitian also created a small stadium or hippodrome, which was at some point used for races (on foot as it is too small for chariots) but which may have originally been a garden. 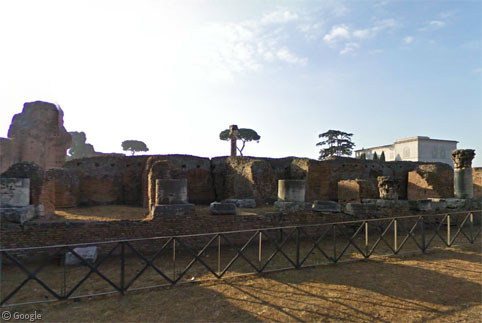 Whatever the purpose, it was presumably used for more intimate events than the nearby Circus Maximus which is overlooked by the palaces on Palatine Hill to the north. It could hold an estimated 150,000 spectators for religious festivals called ludi which would include chariot races, gladiator battles and animal hunts. 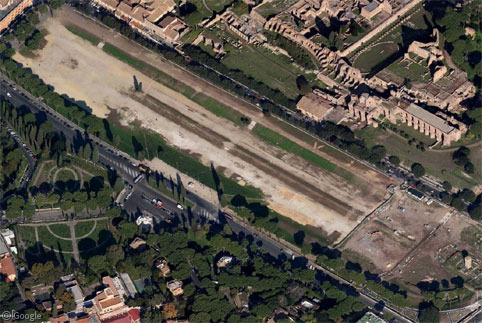 The largest sporting venue in Rome, the Circus Maximus measures 621m in length and 118m in width (2037 by 387 feet). With the area originally farmland, it is believed that the first chariot races took places on simple tracks through fields, but permanent seating structures were first built by around 500BCE. Greatly expanded over the subsequent centuries, and used for both religious and civic events, the Circus saw action for over a thousand years before being abandoned in the 6th century. Time has seen most of its structures disappear, and flooding and soil accumulation mean the original track level is 6m below the current surface. 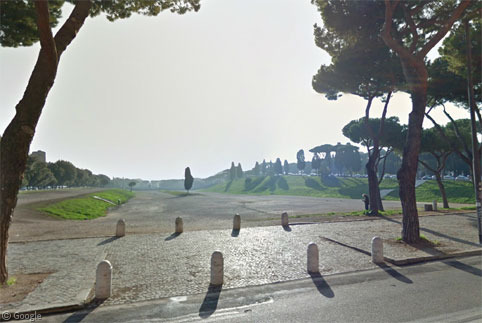 The space is, however, still used for occasional large-scale public gatherings, including concerts and a celebration when Italy won the 2006 World Cup. 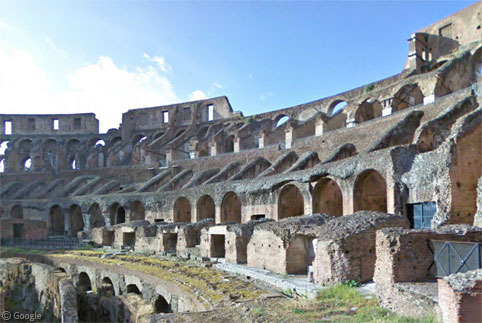 To the north-east is Rome’s other famous ancient sporting venue and icon of the Roman Empire, the Colosseum. With space for 50,000 spectators it had only a third of the Circus’s capacity, but it was a spectacular structure which tested the limits of the era’s architecture and engineering, and much of it survives to this day. 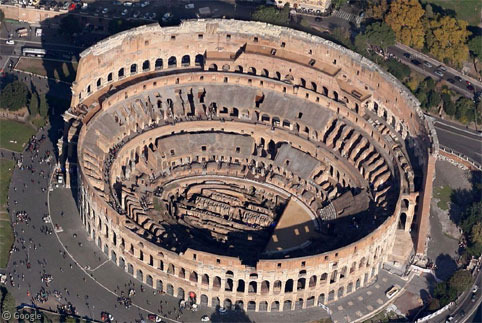 The first events in the Colosseum, or Flavian Amphitheatre, took place in 80CE, after a construction period which lasted close to a decade. 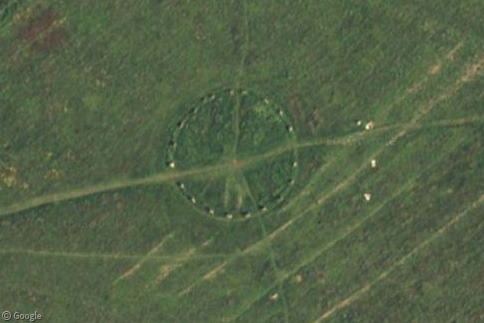 The structure was 189m long and 156m wide (615 by 510 feet). While the northern exterior wall still stands, the southern wall was destroyed by a major earthquake in 1349. The Street View trike accessed much of the interior of the building. Tiered seating closely resembled modern stadiums, with the best (closest) seats reserved for senators. There were also ‘luxury boxes’ for the emperor and other luminaries. 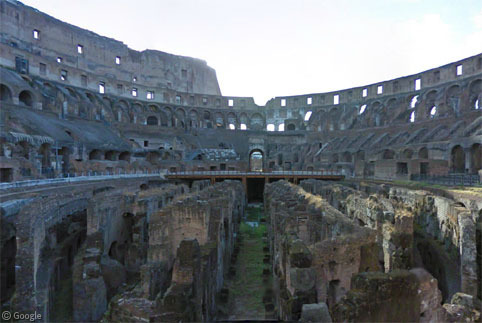 While the wooden arena floor has long since rotted away, this has revealed the hypogeum – an underground labyrinth where gladiators and animals were kept before being brought into the arena for their events. 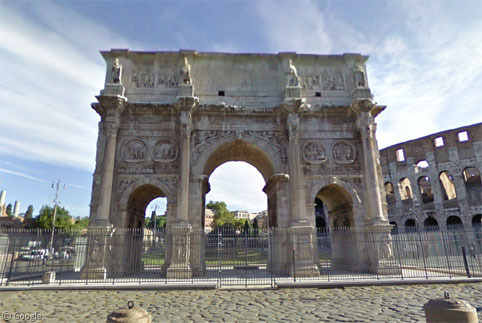 Outside the stadium is the first – and youngest – of several triumphal arches that we’ll look at. The Arch of Constantine was built early in the 4th century to commemorate Emperor Constantine’s battle victory over Maxentius. Some of the reliefs decorating the arch were taken from monuments created a couple of centuries earlier. Heading north-west from the Colosseum, around the northern side of Palatine Hill, there a numerous other important structures from ancient Rome. 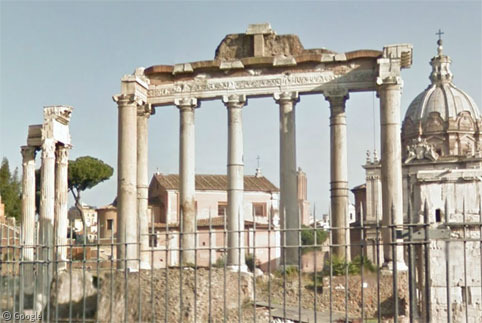 First there is the Temple of Venus and Roma, built for the two goddesses by Hadrian in the second century. 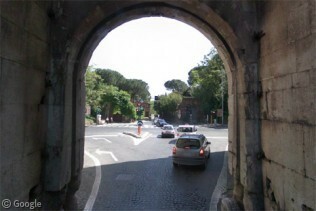 Nearby is our second arch – the Arch of Titus, built by Domitian in 82AD to honour his brother’s victories in several battles. 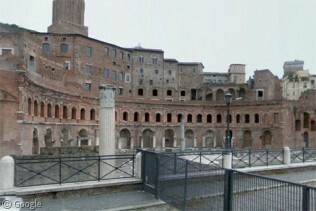 Next we come to the Roman Forum, a public plaza surrounded by temples and other important civic buildings. This was the focal point of life in Rome from the city’s earliest days until the end of the Empire when the area fell into disrepair. 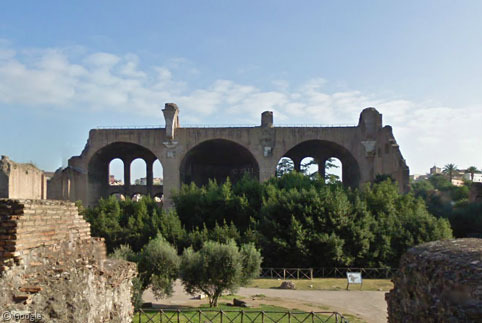 The largest building in the area was the Basilica constructed by emperors Maxentius and Constantine early in the 4th century. Despite the name, the structure probably served as a meeting space rather than a place for religious celebration. The House of the Vestal Virgins was the residence of women selected to serve for decades as chaste senior religious leaders of the city, responsible for keeping alight the sacred flame to the goddess Vesta in the temple at one end of the building. 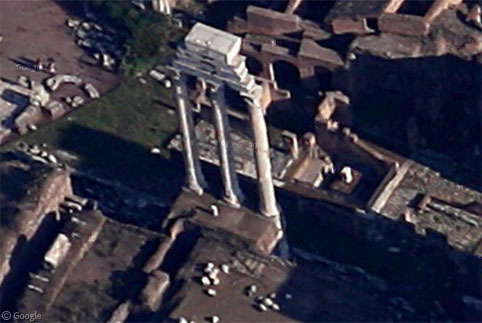 The Temple of Castor and Pollux was originally constructed in the 5th century BCE, though the three columns visible today date to around 6CE when Tiberius rebuilt the temple after a fire which destroyed much of the Forum. 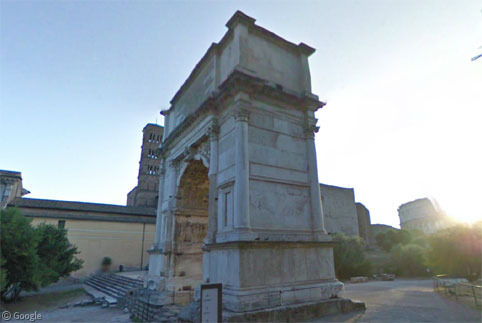 The Arch of Septimius Severus was built in 203CE by his sons, though after Caracalla had Geta assassinated, all mentions of the latter were removed! 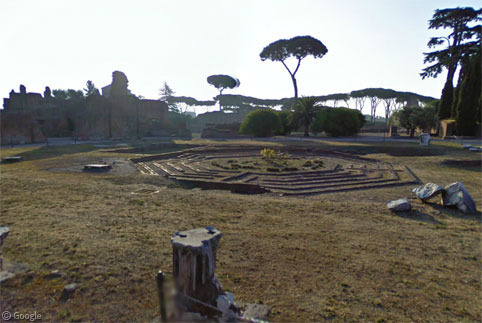 At the western end of the site are several temples, including the Temple of Saturn which dates to around the 3rd century though again there had been structures here for centuries before that. 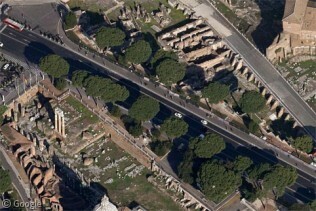 Beyond the Roman Forum lie several other fora, including one built by Julius Caesar in 46BCE (lower left) and a series of small squares built in Imperial times (upper right). These were somewhat restored by Mussolini, but in the late 1920s he built a large ceremonial road through the middle of the site which has led to serious deterioration of the ancient structures. 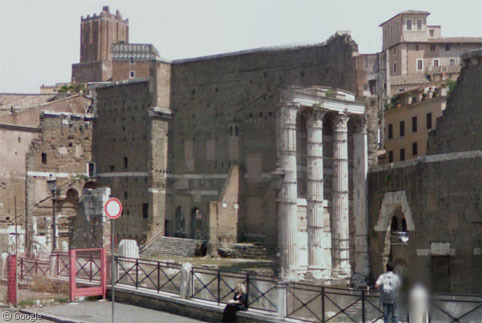 The Forum of Augustus was completed in 2BCE and includes a temple for Mars, the god of war. However, about 100 years later it was superseded by the Forum of Trajan, who also built a large column commemorating his battle victories. Rome is, of course, well known for its thermae – thermal baths which were built by many emperors to serve as gathering places for the community. They often included libraries, shops and restaurants as well as the bathing rooms. 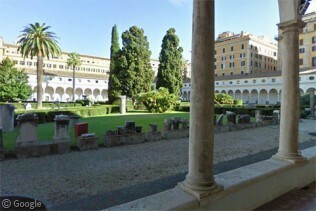 The largest such facility was built by Diocletian early in the 4th century. Many parts of the complex are well-preserved because they were used by for religious purposes – the Basilica of Santa Maria degli Angeli e dei Martiri and the church of San Bernardo alle Terme were built on the site. The Street View trike affords us a look at the interior. 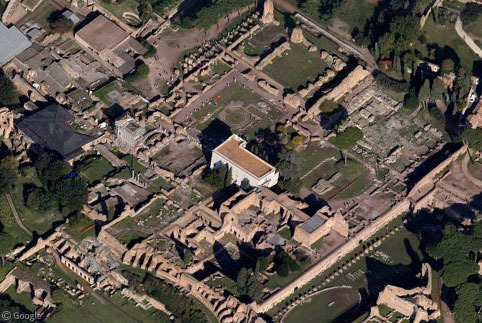 The Baths of Caracalla were of similar size and built slightly earlier, but are not as well preserved. 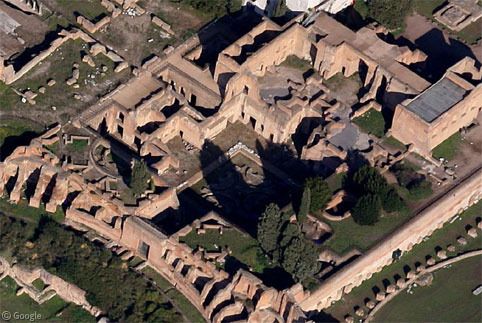 Titus (upper left) and Trajan (right) built baths near the Colosseum, and near the Domus Aurea, a villa (lower centre) built by Nero in 64AD. 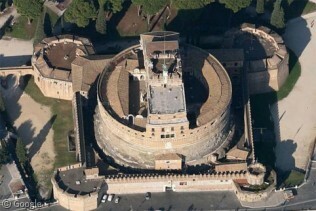 Two large circular mausoleums can be found in the city, one on either side of the River Tiber. 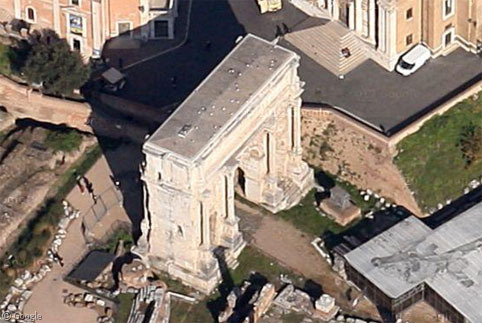 The tomb for Augustus was built in 28BCE but is now mostly ruined and closed to visitors. The structure Hadrian built for himself operates as a museum. 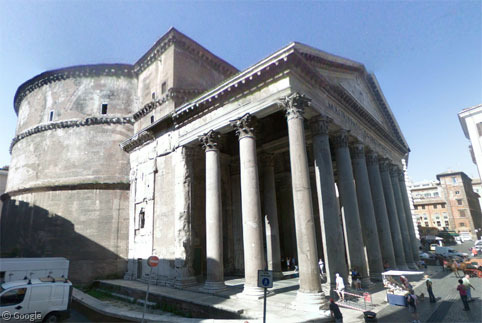 Hadrian is also noted for having completed a reconstruction of the Pantheon, a temple for all ancient Roman gods. 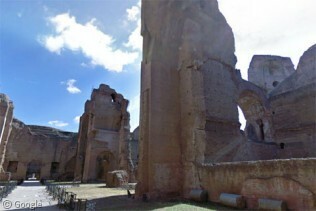 Originally built in 27BCE, it was destroyed by fire in 80CE and restoration was started by Trajan’s architects. The Pantheon is still in use today as a Catholic Church. Rome was well protected for a couple of millennia by two walls, but they are a topic substantial enough for us to visit by themselves in a future post. A truly fantastic post, Ian. Outstanding! Absolutely amazing! – really well researched and great pics. Rome is a wonderful endlessly fascinating city which I had the pleasure of visiting in 1981.Basic rule of thumb- if you are unable to identify a building –chances are it’s a church.I love the Italian country side and the people with their strong belief in enjoying life and family to the utmost.The only problem I had was with the utterly terrifying traffic! How there aren’t a thousand accidents a day still mystifies me to this day.